A REST API should spend almost all of its descriptive effort in defining the media type(s) used for representing resources and driving application state. 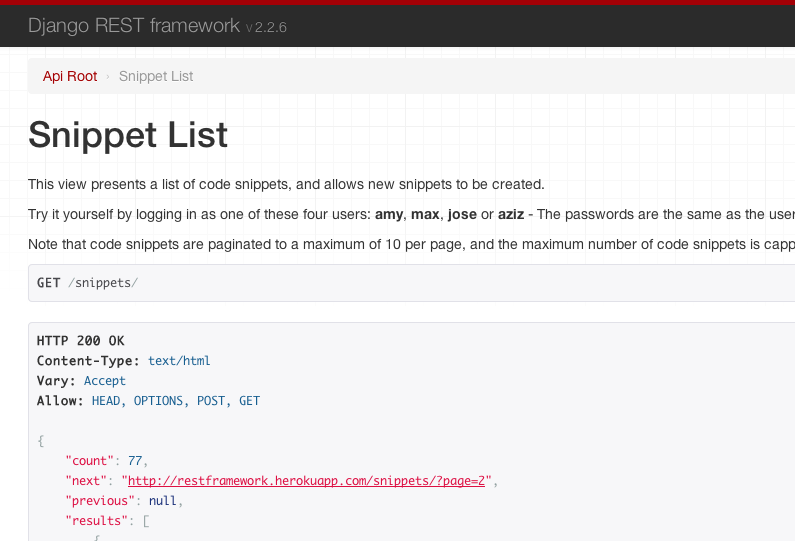 REST framework provides built-in support for API documentation. There are also a number of great third-party documentation tools available. Automatically generated code samples for each of the available API client libraries. The coreapi library is required as a dependency for the API docs. Make sure to install the latest version. The pygments and markdown libraries are optional but recommended. /docs/ - The documentation page itself. Note: By default include_docs_urls configures the underlying SchemaView to generate public schemas. This means that views will not be instantiated with a request instance. i.e. Inside the view self.request will be None. To be compatible with this behaviour, methods (such as get_serializer or get_serializer_class etc.) which inspect self.request or, particularly, self.request.user may need to be adjusted to handle this case. Return a list of all the existing users. If a view supports multiple methods, you should split your documentation using method: style delimiters. Create a new user instance. When using viewsets, you should use the relevant action names as delimiters. Custom actions on viewsets can also be documented in a similar way using the method names as delimiters or by attaching the documentation to action mapping methods. A description of the get method on the custom action. A description of the post method on the custom action. A description of the put method on the custom action. The rest_framework.documentation module provides three helper functions to help configure the interactive API documentation, include_docs_urls (usage shown above), get_docs_view and get_schemajs_view. title: Default None. May be used to provide a descriptive title for the schema definition. description: Default None. May be used to provide a description for the schema definition. schema_url: Default None. May be used to pass a canonical base URL for the schema. public: Default True. Should the schema be considered public? If True schema is generated without a request instance being passed to views. patterns: Default None. A list of URLs to inspect when generating the schema. If None project's URL conf will be used. generator_class: Default rest_framework.schemas.SchemaGenerator. May be used to specify a SchemaGenerator subclass to be passed to the SchemaView. authentication_classes: Default api_settings.DEFAULT_AUTHENTICATION_CLASSES. May be used to pass custom authentication classes to the SchemaView. permission_classes: Default api_settings.DEFAULT_PERMISSION_CLASSES May be used to pass custom permission classes to the SchemaView. renderer_classes: Default None. May be used to pass custom renderer classes to the SchemaView. public: Default True. If True schema is generated without a request instance being passed to views. permission_classes: Default api_settings.DEFAULT_PERMISSION_CLASSES. May be used to pass custom permission classes to the SchemaView. renderer_classes: Default None. May be used to pass custom renderer classes to the SchemaView. If None the SchemaView will be configured with DocumentationRenderer and CoreJSONRenderer renderers, corresponding to the (default) html and corejson formats. The built-in API documentation includes automatically generated code samples for each of the available API client libraries. For each language you need to provide an intro template, detailing installation instructions and such, plus a generic template for making API requests, that can be filled with individual request details. See the templates for the bundled languages for examples. There are a number of mature third-party packages for providing API documentation. drf-yasg is a Swagger generation tool implemented without using the schema generation provided by Django Rest Framework. It aims to implement as much of the OpenAPI specification as possible - nested schemas, named models, response bodies, enum/pattern/min/max validators, form parameters, etc. - and to generate documents usable with code generation tools like swagger-codegen. 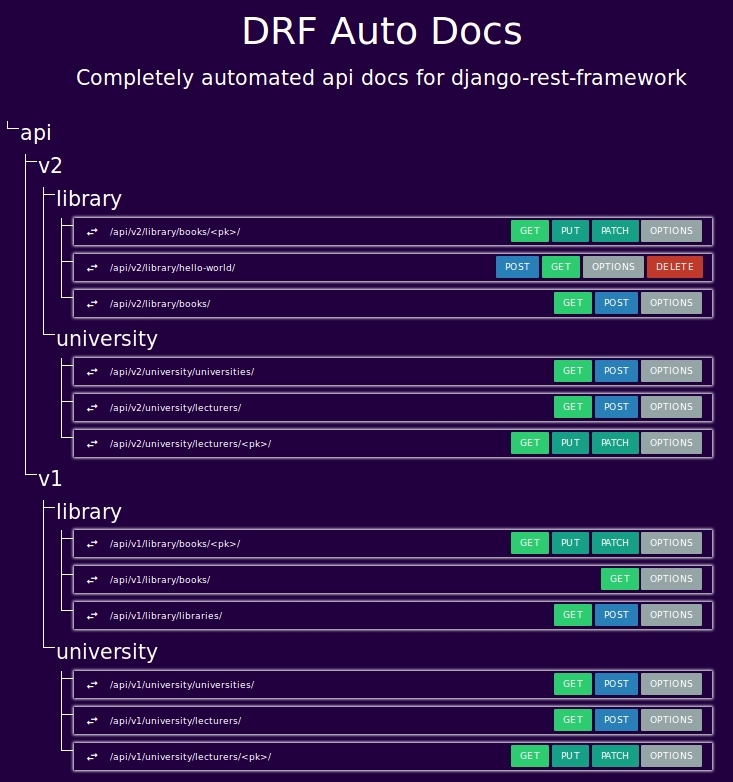 DRF Docs allows you to document Web APIs made with Django REST Framework and it is authored by Emmanouil Konstantinidis. It's made to work out of the box and its setup should not take more than a couple of minutes. Complete documentation can be found on the website while there is also a demo available for people to see what it looks like. Live API Endpoints allow you to utilize the endpoints from within the documentation in a neat way. Features include customizing the template with your branding, settings for hiding the docs depending on the environment and more. Both this package and Django REST Swagger are fully documented, well supported, and come highly recommended. Marc Gibbons' Django REST Swagger integrates REST framework with the Swagger API documentation tool. 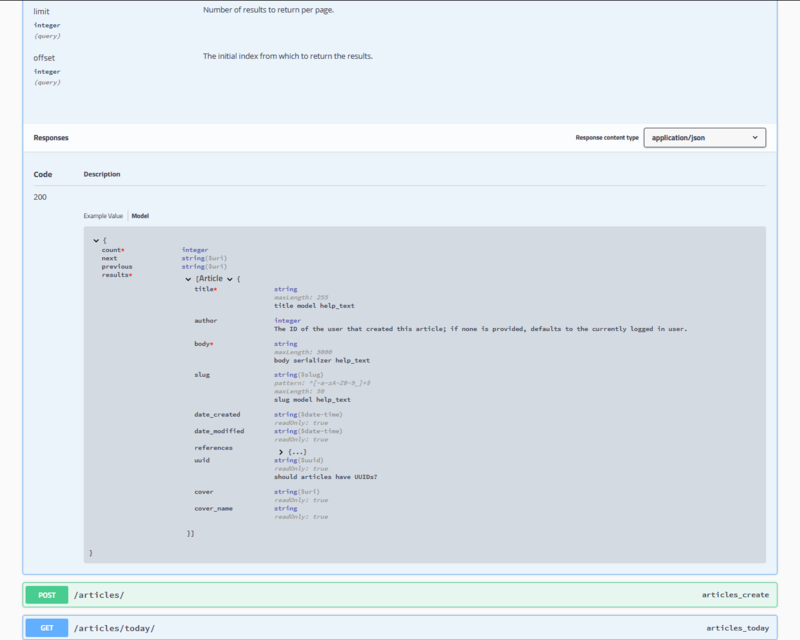 The package produces well presented API documentation, and includes interactive tools for testing API endpoints. Django REST Swagger supports REST framework versions 2.3 and above. Mark is also the author of the REST Framework Docs package which offers clean, simple autogenerated documentation for your API but is deprecated and has moved to Django REST Swagger. Both this package and DRF docs are fully documented, well supported, and come highly recommended. Oleksander Mashianovs' DRF Auto Docs automated api renderer. Collects almost all the code you written into documentation effortlessly. There are various other online tools and services for providing API documentation. One notable service is Apiary. With Apiary, you describe your API using a simple markdown-like syntax. The generated documentation includes API interaction, a mock server for testing & prototyping, and various other tools. The browsable API that REST framework provides makes it possible for your API to be entirely self describing. The documentation for each API endpoint can be provided simply by visiting the URL in your browser. The title that is used in the browsable API is generated from the view class name or function name. Any trailing View or ViewSet suffix is stripped, and the string is whitespace separated on uppercase/lowercase boundaries or underscores. For example, the view UserListView, will be named User List when presented in the browsable API. When working with viewsets, an appropriate suffix is appended to each generated view. For example, the view set UserViewSet will generate views named User List and User Instance. The description in the browsable API is generated from the docstring of the view or viewset. Returns a list of all **active** accounts in the system. For more details on how accounts are activated please [see here][ref]. Note that when using viewsets the basic docstring is used for all generated views. To provide descriptions for each view, such as for the the list and retrieve views, use docstring sections as described in Schemas as documentation: Examples. REST framework APIs also support programmatically accessible descriptions, using the OPTIONS HTTP method. A view will respond to an OPTIONS request with metadata including the name, description, and the various media types it accepts and responds with. When using the generic views, any OPTIONS requests will additionally respond with metadata regarding any POST or PUT actions available, describing which fields are on the serializer. Don't include the view description in OPTIONS responses. See the Metadata docs for more details. To be fully RESTful an API should present its available actions as hypermedia controls in the responses that it sends. In this approach, rather than documenting the available API endpoints up front, the description instead concentrates on the media types that are used. The available actions that may be taken on any given URL are not strictly fixed, but are instead made available by the presence of link and form controls in the returned document. To implement a hypermedia API you'll need to decide on an appropriate media type for the API, and implement a custom renderer and parser for that media type. The REST, Hypermedia & HATEOAS section of the documentation includes pointers to background reading, as well as links to various hypermedia formats.